Mom was right when she told you not to skip breakfast. A healthy morning meal provides the energy you need to start the day and satisfies hunger so you're not tempted to snack or overeat later on. Are you skipping breakfast because you think you don't have time? It doesn't have to be a traditional meal with eggs, bacon, pancakes and toast; save that for a leisurely weekend brunch. There are plenty of options for light but filling and nutritious meals that can be prepared in minutes. Here are some ideas for quick and simple meals that will get your day off to a great start. Which ones appeal to you? 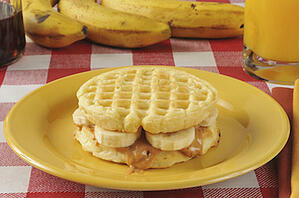 This updated childhood favorite begins with a whole-grain toaster waffle. You can cut it in half or leave it as is for an open-faced sandwich. Spread with two tablespoons of peanut butter and two teaspoons of jelly. Change it up by using almond, walnut or hazelnut butter or substituting sliced bananas or strawberries for the jelly. Soup isn't just for veggies anymore. Simply cut up one cup of your favorite fruit and combine it with one cup of milk. Keep chilled until ready to eat. Mangoes, peaches and berries are some delicious choices. Enjoy this popular treat minus the calories and fat of a fast-food breakfast sandwich. Top two halves of a whole-wheat English muffin or a slice of whole-wheat toast with some sauteed spinach. Add two fried eggs, one slice of cheddar cheese, and season to taste. This is tasty enough to work as a dessert as well as a breakfast. Just alternate layers of plain or vanilla Greek yogurt with your favorite berries. Boost your fiber intake by adding wheat berries, brown rice or barley. Kick-start your day with this spicy Southwest dish. Top a six-inch corn tortilla with scrambled eggs seasoned with salt, pepper, fresh oregano and ground red pepper. Add two ounces of shredded Colby Jack cheese and finish with salsa or pico de gallo if desired. Avocados are loaded with heart-healthy fats and vitamins, making them a nutritional bonanza. Spread ricotta cheese on a slice of whole-wheat toast and top with sliced avocados and a sprinkle of crushed red pepper. This dish is prepared the night before for the ultimate convenience. Combine 1/3 cup of rolled oats with 1/2 cup milk, 1/2 of a mashed banana, 1/4 cup chopped nuts and a dash of cinnamon. Place in a sealed plastic container and refrigerate overnight. Heat them in the microwave for a minute or two if you want to warm it up. These items also serve as snacks to replace those mid-day candy bars and potato chips. Most of them can be prepared beforehand in the kitchen of your Springs Apartments home so they're ready to eat later. And be on the watch for the occasional, complimentary breakfast-on-the-go from Springs Apartments as you leave for work. It’s one of small ways we like to surprise residents and show our appreciation for them.